Idaho is the perfect state if you are looking to buy recreational property. Whether you’re looking for a property by the water or in the mountains, we can help you find a recreational property that is right for you. The state of Idaho has over 823 square miles of water. The glacial sheets that once covered Idaho during the Ice Age have since melted and created many freshwater lakes that are perfect for fishing or boating. Idaho is also home to over 3,100 miles of rivers which are perfect for those who love to white water raft. Idaho residents have plenty to enjoy by living in these areas. Begin your search by looking below at our properties on the water. If you are an off-road vehicle enthusiast, consider buying property in St. Anthony, Idaho. St. Anthony is home to 10,600 acres of white quartz sand blown into 400 foot high dunes. You can also look into properties in Bruneau. Bruneau is most well-known for Bruneau State Park which is famous for its 470-foot high sand dune. These are great locations to buy a house if you love to camp and play at the dunes. If you love to hike, or simply just want to enjoy the amazing view, take a look at our mountain properties below. Idaho is home to many mountain ranges including Borah Peak, the tallest point in Idaho, and The Rocky Mountains in the North-Eastern part of the state. Mountains like these are home to many cabins that are close to a variety of outdoor activities that make the properties a must-buy. Idaho is home to over 7,200 miles of snowmobile trails and terrain. 950 of those miles are found in Island Park, which is the perfect location for a cabin. 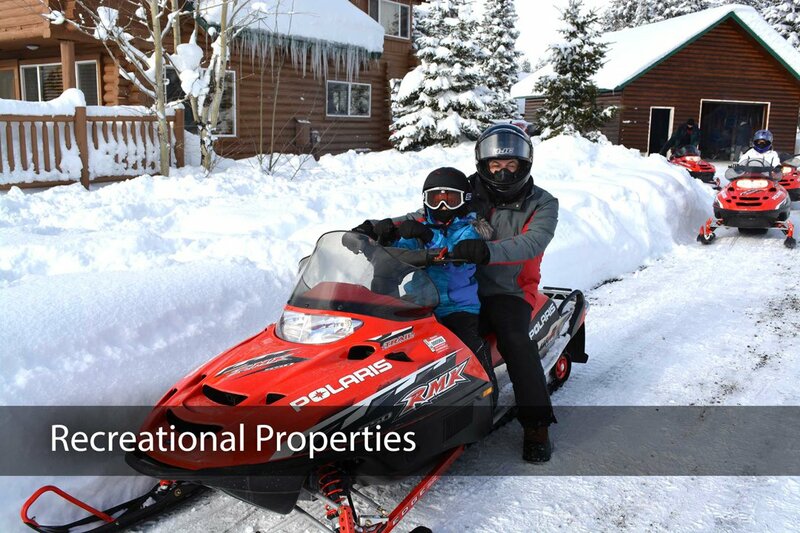 Other popular snowmobiling areas are in McCall, Teton Valley, and Malad. This heavily wooded 4.61 acre lot has panaramic views over looking Henry's Lake. Shotgun West lot is .92 of an acre. Away from the normal busy area of Island Park. Has Community water. Needs a septic. Leave your RV here all summer. Beautiful wooded lot to build your dream cabin on. Close to world renowned fishing and West Yellowstone park. Beautiful forested acreage near the Henry's Fork Outlet. 85 acres of lush vegetation and rolling hills. Great building lot overlooking Henrys lake. Can have trailer on lot. Beautiful timbered lot located in new subdivision with strict HOA to protect value. Privacy and accessible year around. Beautiful building lot with lots of trees. Approx 1.54 acres. Power and phone in the area. Year round access with asphalt roads. Strong covenants.